Well, I was going to say that the Windows 10 technical preview solves many of the problems that Windows 8 has, including the lack of a start button. I installed this in a virtual machine both to take a look at 10, but especially to take advantage of updates to Windows PowerShell, which are available only with Windows 8 or later. I’m happy to say the start button is there. 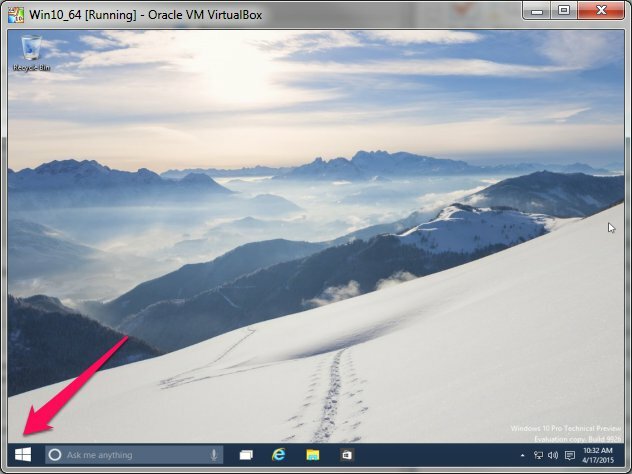 The start button leads to the tiles left over from Windows 8. Maybe this can be re-configured to avoid the tiles? Didn’t Microsoft get the memo that people working on business-class desktop computers DON’T WANT TILES! At least not the default ones, with videos, the stock market, etc. OK so you can right-click and delete a tile. I can imagine configuring this as a standard operation when deploying a new desktop computer to a co-worker. If you look in the document explorer the new icons are even more cartoon-like than than before. 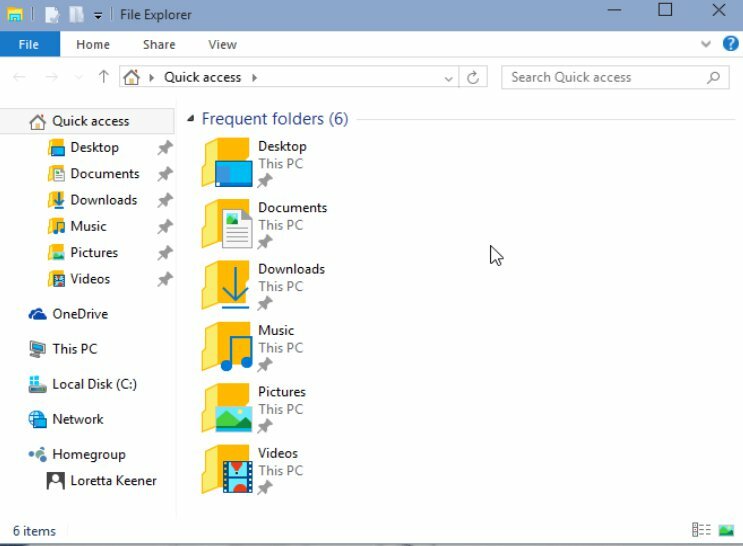 It makes me nostalgic for the old “cartoon-like” icons of Windows XP. This entry was posted in Uncategorized and tagged Powershell, Windows on April 17, 2015 by lkeyes70. After much fiddling, I seem to have been able to get my domain techfornonprofits.com to map directly to this blog, which is hosted with bloodspot.com. For a week or two it seemed it was lost in the ether, and I’m still not exactly sure what fix finally was. But, between Google/Blogger, and my domain host at Network Solutions, it looks as if the DNS records have finally got sorted out. Techfornonprofits, the blog was started when the Blogger program was relatively new, before it was purchased by Google. My first entry was in February of 2001 which seems like ancient history now. I’m trying to sell a few DocBoxes. These are industrial-strength Mini-Itx machines originally sourced from Logic Supply. The have AOpen cases and motherboards, using Intel Celeron chips, with 1 meg of memory, a 60 or 80 Gig hard drive, and a CD or DVD-ROM. I originally had them loaded with Windows XP embedded, or Windows 7 embedded, but have reformatted them to use Xubuntu, which is Ubuntu configured to use the XCFE interface, a lightweight front end which seems to work well with the limited 1 meg of RAM on these machines. The best thing that I liked about this was a stock installation of Xubuntu automatically found the wireless network interface, and my wireless router and my printer. With XP and Windows 7 I had to go rooting around to find drivers for both of these things. 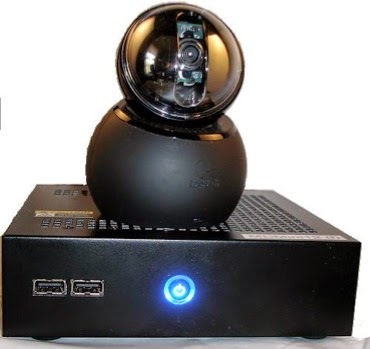 The picture shows the docbox with a Logitech Orbit camera on top, which was the original configuration. I’m experimenting with how best to advertise and sell these, with a couple options, Craigslist, eBay via Global Garage, a third-party seller, and Do-It-Myself eBay. This entry was posted in Hardware and tagged Hardware, http://schemas.google.com/blogger/2008/kind#post, Windows, XPe on December 29, 2014 by lkeyes70. Having spent some hours figuring out how to script an FTP transfer, I thought I’d describe my kludge. Maybe someone can suggest a more elegant way. I’m trying to I’m connect to a FTP server on my Linux box to upload a file. 3. Use Powershell to manipulate a command line FTP program, such as the Putty Secure FTP program PSFTP. I started with the second option recommended on TechNet. 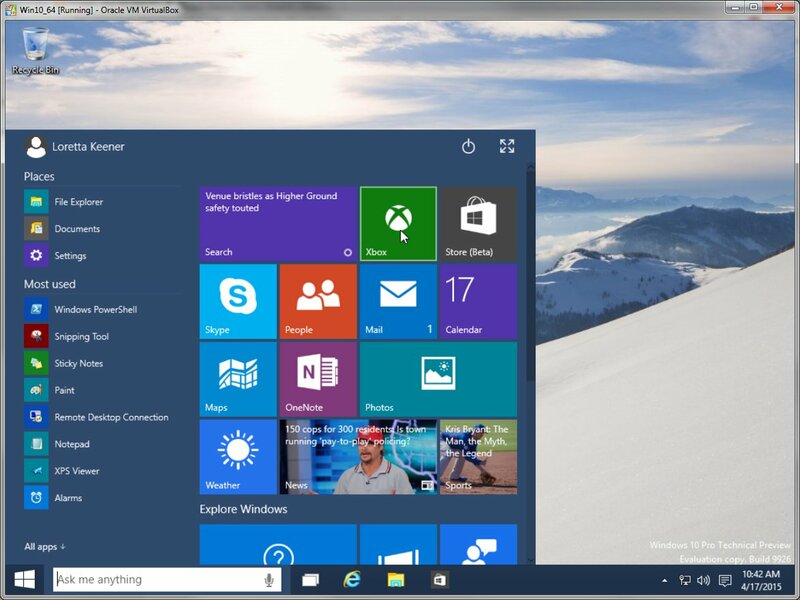 Looks great, and I thought that it was semi-official (being from Technet). I was unable to get a connection and I think it may be related to the fact that module apparently doesn’t support SFTP version 2. There are a couple other quirks with the module… including the fact that the user name and password are passed to the command line as an object. By the way, both option 2 and 3 have the same name, PSFTP. The psftp program is located in the current directory. -2 is SSL version 2. If you run this from the ise, it returns the PS command as shown. If you run this from a regular powershell command session, it will keep you in the PSFTP session, and you can run use the usual FTP commands….like CD, etc. 1. I might be able to configure the FTP server running on the Linux box to accept the connection from the PowerShell FTP module. I haven’t investigated that possibility but presumably it would be less secure in terms of encryption. 2. The script above has the name and password in clear text. Not a best practice. 3. Various versions of FTP are described on this page. This entry was posted in Uncategorized and tagged FTP, Linux, Networking, Powershell, Putty, Windows on October 29, 2014 by lkeyes70. 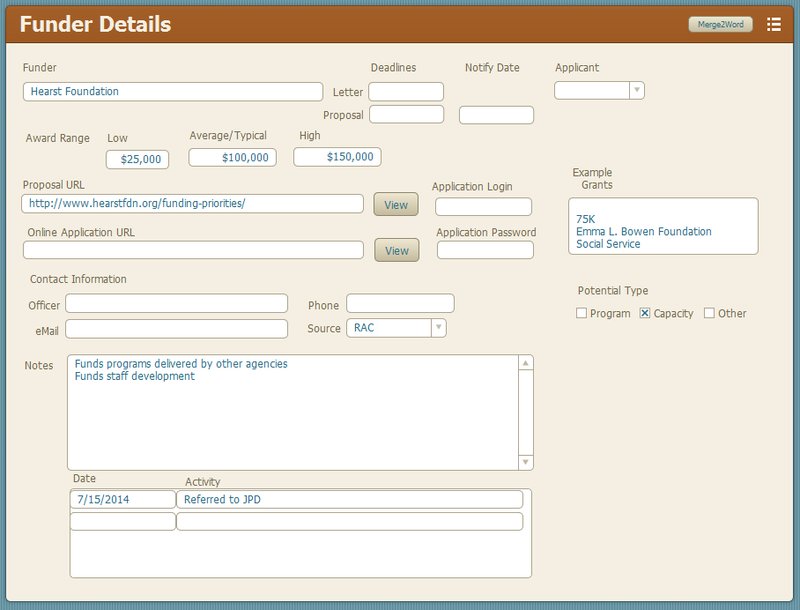 I put together a grants database screen (click to view full size) to consolidate information for funding sources, and to track dates and interactions. It is definitely an evolving project, but contains the basic information need to contact the funder, the deadline dates involved, the funder’s areas of interest, and the typical range of a grant award. So far, I’ve been concentrating on foundation funding. Many foundations typically ask for a letter of interest before you put together a full proposal. So, I’ve included multiple date fields, a deadline for a letter of interest, a deadline for a full proposal, and a date when they announce their award. Links to standard “boilerplate” paragraphs that are used in an application. Links to edit the proposal or letter directly in Word. Links to the PDFs of the proposal. Reports that create a grants calendar. Before anyone comments that “you should really use X software” for this purpose, I just want to say that I’ve used several in the past, including DonorPerfect and Blackbaud, and evaluated many others. Right now, I’m in the process of rethinking my entire workflow automation from the ground up, and this very lightweight approach is just what I’m looking for. Plus its in FileMaker, so I can run it on my Windows machines at work, or my Macs at home. This entry was posted in Software, Tech_Friday and tagged Applications, FileMaker, Fundraising, Grants, http://schemas.google.com/blogger/2008/kind#post, Mac, Software, Windows on September 16, 2014 by lkeyes70.